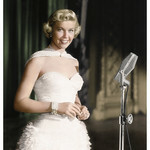 The trouble with Doris Day—besides the wreck of her marital life that left her at various times by various husbands abused physically, emotionally and financially—was that she never stopped sounding and looking and being, at least outwardly, so darn nice. Still is, actually, as evidenced by a nice, if characteristically formulaic, written interview she gave to “The Hollywood Reporter” on her 97th birthday three days ago. That niceness of the midwestern, sunnyblonde film star who wore a relentless effervescent smile was a problem for Day chiefly because it tended to obscure just what a fabulous singer she was. No one mistakes, say, Nina Simone, as anything but a kickass singing talent, all that smoldering, sometimes volcanic expulsion of words and emotion cementing her place in history as a singer of extraordinary passion and skill.